As we all of you know Nagarjuna University conducting the exams in the jumbling order. That if your studying in some college, you can't write the exams in the same colleges 90%. So, Here is the preparation plan for external exams. College life brings a lot of changes in anyone’s life, irrespective of place, ethnicity and level of merit. While the cream of the lot remains busy in preparing notes, referencing with the online resources, the back benches have the fun of their life attending parties, planning for the prom or bunking classes. However, all students have a common thing in life-that is exams. Whether it is a mid semester exam or the final one, every student needs to prepare well. Below listed are a few handy tips that can help college students understand how to prepare for the forthcoming exams. A basic plan- Not every student will be brilliant or meritorious but having a plan and adhering to it does help things in the long run. You can make a basic plan for covering the syllabus for each subject. This should be done right at the beginning of the semester. If you stay online a lot or remain glued to the PC, it is prudent to prepare a chart or list of subjects and plan to cover them time wise. That way you will be able to track your progress and scouring through books before a few days of the exam will not be necessary! You can also use online planners and apps to set reminders. Stop bunking the classes- The lure of a student’s outing or skipping classes to catch a movie can be strong but remember attending classes is also necessary. You cannot always count on your peers to get the notes of missed classes. Besides, attending classes make you better prepared for exams, for any subject. Listening to lectures of professors help you memorize things better and by missing classes you may eventually miss things hard to find elsewhere, including books and the web. Know what works for you- There is no shortcut to success and the same saying is true for preparing for college exams as well. However, not every student can excel in the same method. For some students, reading for hours and writing for long may seem robotic, boring and they may find it hard to concentrate. Try to be a little innovative, and find out the method of studying that works the best for you. For some students, writing while listening to light music works the best. There are some others who find it hard to focus on studies during the day. 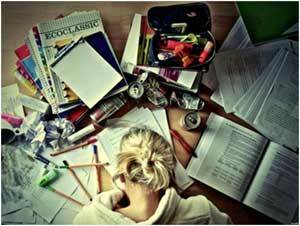 Keeping distractions away- When you study, keep sources of distractions at bay- more so before a month of the exam. Social media and mobiles are two such big sources of distraction for college students and the lure of checking whatsapp and Facebook can be hard to resist! It would be a good idea to keep mobile phone silent and away when you study vigorously for exams. Similarly, it is prudent not to keep any outing, party or leisure plans before the exams. On the contrary, you will do well by keeping such plans in store for the period after the exam. So, follow the above procedure and we will also help your for your external exams by providing materials, guess papers and important questions ext... If you feel particular subject is difficult please comment below, Our Team help you.